Although Milos Raonic fell short in his attempt at a Wimbledon title, Canada did secure a championship Sunday at the All England Lawn Tennis Club, with Denis Shapovalov defeating Alex De Minaur of Australia 4-6, 6-1, 6-3 to claim the boys singles title. Shapovalov, who was seeded No. 5 based on his ATP ranking, needed some time to adjust to the setting on Court 1 and to his first junior slam singles final. "I was very nervous, to be honest. I started off making a lot of errors in the first couple of games," said the 17-year-old left-hander, who was broken in his first two service games. "After I got broken the second time, I just told myself, calm down a little bit. I started making some longer rallies. By the end of the set, I gained my confidence back. I was ready to go in the second." No. 7 seed De Minaur, also playing in his first junior slam singles final, held on to secure the opening set, but felt that once Shapovalov shook off the nerves, he was in danger. "I won the first set, but I still didn't feel like I played well," said the 17-year-old, who was born in Sydney, but now lives and trains in Spain. "I thought he gave away a couple of cheap games here and there and I sort of did the bare minimum to get over the line in the first set. Then he lifted up his game and I didn't. He started finding his rhythm, hitting big balls and I was still stuck trying to find the middle of the racquet." Shapovalov cruised through the second set, and got the only break he needed in the third game, closing out the four-deuce game with a sizzling backhand pass and a forehand winner. 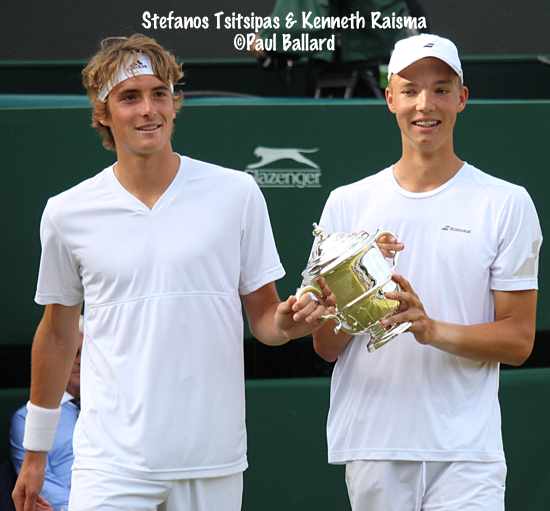 "It was tough in the first," said Shapovalov, mentioning De Minaur's flat strokes as a challenge, one he had not faced with previous opponents. "Then in the second, I kind of found confidence again, started going for shots. When I broke him the first time (in the third set), at deuce, I think I had a backhand pass. I just ripped it as hard as I could, hoping it went in, and it did. The next point I had an inside-out forehand. I told myself I'm going to go for it, I don't care if I miss, I'm going to go for my shots. I went for it, made it, got the break." Shapovalov held his next two service games without incident and at 5-3, De Minaur had to hold to force Shapovalov to withstand the pressure of serving out the match. A slice missed for 0-15, and De Minaur then somehow managed to botch a simple putaway standing a foot from the net to make it 0-30. The thousands of Court 1 fans could scarcely believe the error, with their reflexive gasp turning to resignation that De Minaur would probably not recover from it. 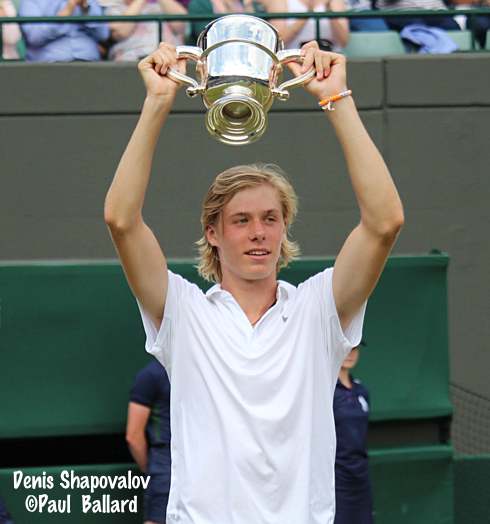 Shapovalov, showing no sympathy, crushed his one-handed backhand for a winner to earn three match points, and although he made unforced errors on the first two, De Minaur double faulted on the third, giving Shapovalov the championship. "I just don't feel I hit many clean balls out there," said De Minaur, who spent a significant portion of the match behind the baseline, unusual for him. "The ball was swirling around. But still, he's a lefty, a difficult player to play and he had really good passing shots. He didn't give me a lot of opportunities to come in, but definitely, if I could look on this match and say what I needed to do better, it was definitely to play my game more, try to be more aggressive. Even though I would end up losing, if he beats me, then that's too good. That's why I'm a little disappointed, because I didn't come in and play how I needed to play. But you live and you learn." Shapovalov, who also won the Roehampton Grade 1 last week, is now on a 12-match win streak on grass and, unsurprisingly, likes how the surface fits his game. "Yeah, it's unbelivable," Shapovalov said. "I think my game suits it a lot. 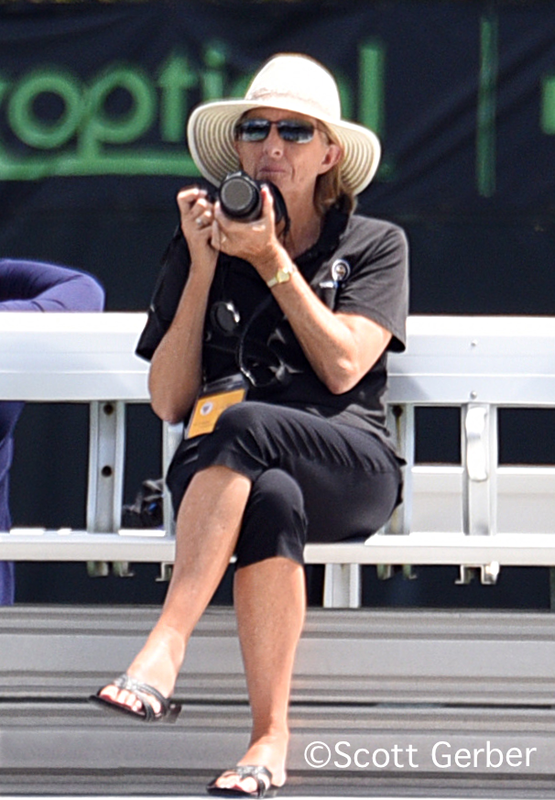 I knew going into grass courts, I was very excited for it. I knew from last year, I beat the world No. 5 first round of Wimbledon last year. Yeah, of course, I love playing on grass." Shapovalov will make his ATP debut at the Washington DC Citi Open in two weeks, and as of now, is planning to play the US Open Junior Championships in September. De Minaur, who said he will return to Spain and spend a couple of days at the beach before playing a Challenger in Segovia at the end of the month, is also scheduled to compete at the the US Open Junior Championships. Shapovalov and Felix Auger-Aliassime, who won the doubles title last year in New York and were top seeds this week, fell short of their second junior slam doubles championship late this afternoon, falling to No. 2 seeds Stefanos Tsitsipas of Greece and Kenneth Raisma of Estonia 4-6, 6-4, 6-2. Tsitsipas and Raisma, playing together for the first time, had won two previous matches from a set down this week, so they did not panic when they found themselves in that situation again. "I wasn't concentrating on this moment, I got a little bit stiff," said Tsitsipas, who surrendered the first service break of the match at 4-5. "They just played good and broke us." That was the last break point Tsitsipas and Raisma would face in the match, and they secured the second set with a break of Auger-Aliassime in the fifth game. A break of Auger-Aliassime at 1-1 in the third set gave Tsitsipas and Raisma the lead, and when Auger-Aliassime was broken for a second time in the set, having had a 40-0 lead in the game, the end was a formality. Raisma served out the championship at love, giving both Greece and Estonia a first Wimbledon Junior title. Raisma gave several reasons why he and Tsitsipas meshed so quickly. "For one thing, he's right-handed and I'm left-handed," said the 18-year-old. "They don't get used to our serves. And I think the most important thing is that we are good friends. On the court, it helps a lot." When explaining what his first junior slam title meant to him, world No. 1 junior Tsitsipas also described what it meant for the pair's respective countries. "A title is full of emotions," said the 17-year-old. "You get the flashback of the whole week, how it went, and it makes you feel even more satisfied. I think from both of our countries there has never been doubles champion from Greece or Estonia as well. We are both from small countries with not a tradition in tennis and it's very important to make our countries proud, and the people that support us." "Even though we are from different countries, we feel like one family at the moment," Raisma said. The United States was guaranteed a girls doubles champion after Saturday's semifinals, and it was the all-American team of Claire Liu and Usue Arconada who put their names in the record books, beating Mariam Boltvadze of Georgia and Caty McNally 6-2, 6-3. Arconada and Liu, seeded fourth, lost the first two games of the match, but then reeled off nine games in a row. "They started quick and we were slow at first," Arconada said. "I think it was just nerves at first. "We just didn't start as aggressive as we usually are, and that's what happened, but after that, nine straight games is pretty good I guess." "Once we started getting ourselves pumped up, poaching a lot more, that definitely helped," Liu said. Liu and Arconada, who beat top seeds Anastasia Potapova and Olesya Pervushina of Russia in the semifinals on Saturday, believe their more assertive games gave them an advantage. "Every morning we work on being aggressive and trying to poach whenever we can, come forward all the time," said Arconada. "We're not just rallying, we actually try to go the net," Liu added. The unseeded McNally and Bolkvadze, who had never played together before and didn't know each other prior to doubles sign-in, kept Liu and Arconada's second set lead to one break. They had break points in Arconada's and Liu's last service games, but could not win that big point. "They were crossing pretty early in the match," said McNally. "I think we probably could have mixed up balls more, lobbed here or there, hit a heavy ball, slice away from them. If we could have been the first ones to poach, I think that would have turned the match around." Bolkvadze, who is 18, and McNally, who is 14, are not likely to cross paths again, but they were pleased with their ability to quickly come together as a team. "The first match, we were still getting used to each other's game styles, but as the tournament went on, our game styles went really well together," McNally said. "She's really good at the net," said Bolkvadze, a left-hander. "And I'm hitting quite heavy balls from the baseline, so I think it suited very well our game styles. She was crossing on my serve all the time, so I think we played well together." Liu was called on to serve out the title at 5-3, and went down 15-40. Staying aggressive, Liu and Arconada won the next three points, but the first championship point got away when Arconada missed a volley. "I was so nervous," the 16-year-old Liu said. "After the first match point, I thought, oh my god, I think I'm going to throw up." 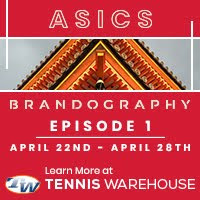 "But it was fun," said the 17-year-old Arconada, who hit a volley winner to set up the second match point, which they converted when McNally's backhand found the net. "I think we both had a really good week; quarters in singles, that's pretty good too. It's been a really exciting week." 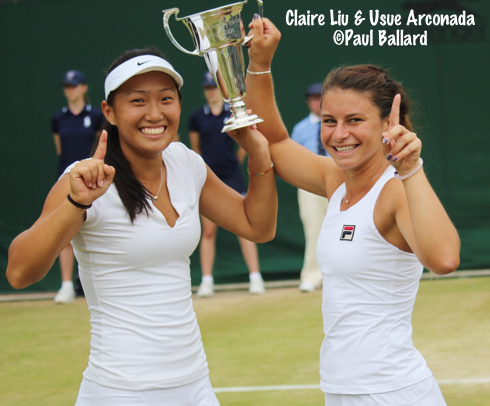 Arconada and Liu, the first all-American team to win the Wimbledon girls doubles title since Jennifer Capriati and Meredith McGrath in 1989, are not planning to play together at the USTA Nationals in San Diego next month having already committed to other partners, but may try for another junior slam at the US Open. "We would like to play with each other, but we have to talk to the coaches, I guess," said Arconada.